The Zooka is elegantly made of machined 7075-T6 aluminum and comes with all Titanium bolts from the factory. There are two primary parts, the quill tube, and the extension tube, as well as three secondary parts, the front binder clamp, the expander wedge, and the quill cap. The quill tube appears to be machined from aluminum rod. Its entire surface, inside and out shows evidence of machine work to make its dimensions perfect to the specifications. At the top of the quill tube, un-seen as you look at the Zooka, the outer diameter of the quill tube is reduced from the 2.5mm thick tubing wall. This reduced diameter is the top 20mm of the quill tube, and leaves a shoulder that presses up against the bottom of the extension tube after it has been pressed and bonded in place. The extension piece is a complex bit of machining, all taken from a single piece of aluminum. At the quill end, a 22mm diameter hole is bored to a depth of 10mm, a 19mm diameter hole extends through the extension piece exposing the 20mm inner diameter of the quill tube. The extension changes into a cylindrical shape 53.45mm from the quill end. The length of this cylindrical extension is what determines the length of the stem. The outer diameter of this extension is 31.7mm. The top of the quill is closed off with a machined aluminum cap. The cap has a 15mm diameter to a depth of 10mm, making a recess and cradle for the expander bolt head. The hole becomes 9.3mm as it passes through the cap. The wedge is machined from aluminum rod, and slightly heasy at 19.5 grams. The Zooka uses SRP Titanium bolts throughout. The expander has 8mm x 1.25mm threads with a 129mm length (at least 11mm longer than it needs to be), 27.5 grams weight and a 6mm hex fitting. The two binder bolts are 6mm x 1mm with an 18mm length, a 3 gram weight, and 5mm hex fitting. The Ringle Zooka mountain stem will fit any 25.4 center diameter handlebar without a shim, or a 22.2mm bar with shims. The Zooka mountain stem is available in six colors, Blue, Black, 3DV Three Dimensional Violet / Lavender, Pewter Grey, Red or Silver in three diameters, 1" , 1 1/8" or 1 1/4". The Zooka comes in three lengths. The 120mm and the 135mm long models are made with a 0 degree, +10 degree or +17 degree rise. The 150mm long model is made only in a 0 degree rise or a +10 degree rise. The weight of a 0 degree rise, 135mm length Zooka is 274 grams. Ringle has discontinued the quill based version of this stem. We have a few of them on closeout in the Special Sheet. 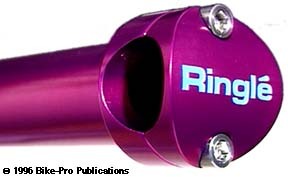 Ringle also make a Road Racing version of their mountain stem. The Road model has a horizonal drilling for the handlebar that is 26.0mm in diameter so all standard road bars except Cinelli with a 26.4mm bar center diameter will work with it. The Zooka road is avaialable only in the 1" quill diameter, and only in Black or Silver. The Road Zooka is available in four lengths, 90mm, 105mm, 120mm, or 135mm all are 0 degree rise stems. Ringl also makes the 120mm length in a minus 12.5 degree rise. These stems aren't kept in general inventory but we can special order it for you. These are again in very limited supply because Ringle has abandoned the quill stem market. Another variation of the Zooka works on non-thread fork steerer tubes, and is compatible with all Aheadset items. The Clamp-on Zooka uses the same extension piece with the same front binder clamp piece and bolts, however there is no quill tube, or expander bolt. A 16mm hole is drillled horizontally through the extension near where the quill tube would have seated. The hole is actually drilled so it would have passed through the front of the quill. To fasten the Zooka to the fork steerer, two clamp pieces are machined 7075-T6 aluminum alloy rod. The clamp pieces each have quarter round hollows on the inner ends, one piece is drilled and threaded, the other is drilled to recess the bolt head and allow the bolt to pass through. 3mm from the threaded clamp pieces flat face is a recess for an O-ring. The O-ring holds the threaded clamp anchor piece, in place within the 16mm hole. A single 6mm x 1mm thread pitch with a 26mm length, weighing 4 grams having a 5mm hex fitting, passes through the non-threaded clamp piece anchoring into the threaded piece. As the two quarter-round ends are drawn closer by the bolt's tightening they constrict and clamp onto the steerer. The machined aluminum cap is slightly different, having a recess (10.3mm wide by 6.2mm deep) to acomodate the 6mm x 1mm bolt used commonly (but not included) to cinch the Star Fangled Nut (really a square steel tubing nut). Clamp-on Zooka's will fit any 25.4 center diameter handlebar without a shim, or a 22.2mm bar with shims. 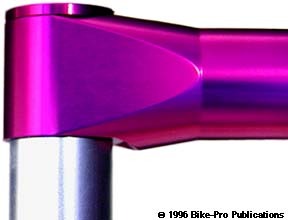 The Clamp-on Zooka stem is available in six colors, Blue, Black, 3DV Three Dimensional Violet / Lavender, Pewter Grey, Red or Silver in three diameters, 1" , 1 1/8" or 1 1/4". The Clamp-on Zooka comes in three lengths, 120mm, 135mm and 150mm long in a 0 degree rise or a +10 degree rise. The weight of a 0 degree rise, 135mm length Clamp-on Zooka is 189 grams.